Doug Preston of DP Turf MA gives us his overview on why Polypropylene putting greens are a better choice over nylon. What about the speed are they the same? 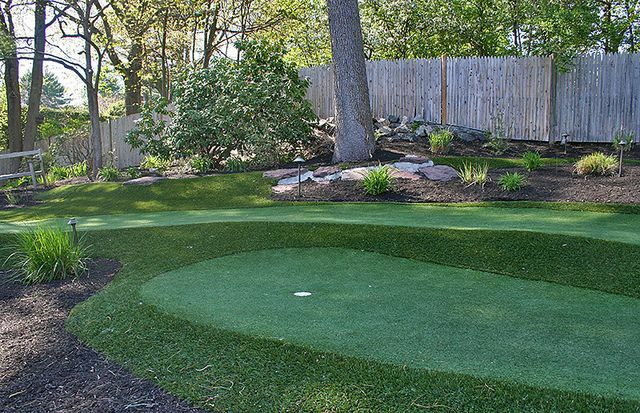 Do you have a question about your backyard putting green or any turf question give us a call or contact us by clicking here. The following post is republished from Southwest Greens Ohio. Knowing that different companies are utilizing different grades of products and there is a significant amount of misinformation on the internet, the below is an opinion-based synopsis from Southwest Greens International. It is not up to us to pass judgment on the competition’s product selection, installation ability or company strategy. We can, however, speak intelligently about the differences in product and why Southwest Greens has an exclusive network of certified installation based franchisees worldwide. One of the major arguments misconstrued from competitors and misinformation on the internet against a sand-filled product, is that sand-filled polypropylene greens are grainy and require a lot of maintenance. 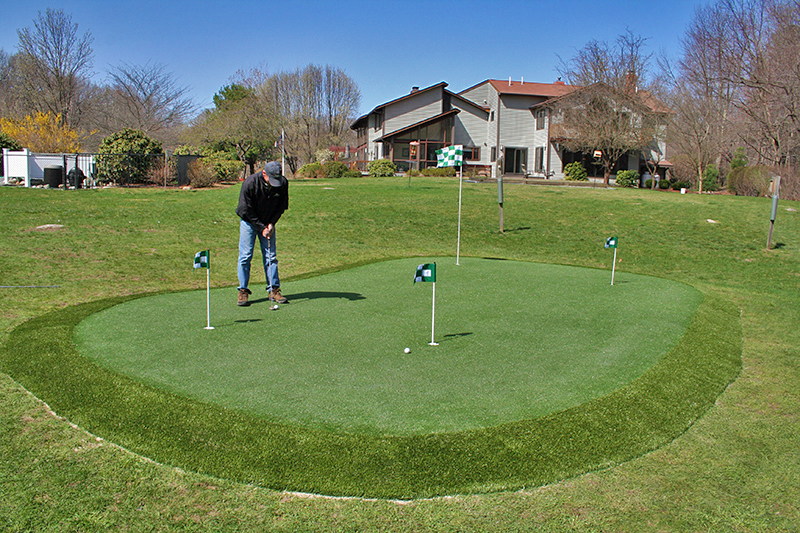 If a sand-filled green is filled and rolled appropriately, as our certified installation-based franchisees are trained, that grainy statement is far from the truth, as our golf greens simulate bent grass and should putt the same speed from all directions. 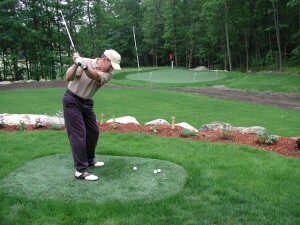 After all, since we do not pay endorsement fees, our PGA tour professional clients demand a golf green that will simulate a natural golf green in not only its natural reaction for chipping, but also ensuring the ball tracks ‘true’ in its roll. Our product and our company must perform. 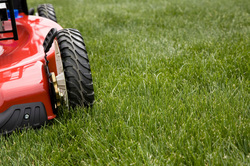 Secondly, whether a nylon or polypropylene surface, maintenance will be required due to dirt and debris. Speed can be controlled on a sand-filled polypropylene golf green, whereas speed can not be controlled on a nylon putting green. We see the maintenance portion of the business as not only another revenue stream but a great way to ensure client satisfaction and get more business. All real golf greens get top dress maintenance, so our artificial golf greens are no different. The difference between a 7600 denier putting green and a 5700 denier putting green is a very important distinction. When we asked our yarn manufacturer they stated it is a very simple analogy as it is the difference in building a house on 2×10’s (7600 denier) and 2×6’s (5700 denier), which is going to have the opportunity to last the test of time? They stated the 7600 denier should last the test of time in comparison to the 5700 denier. The 7600 denier is the premier putting surface yarn. Why an exclusive system of Southwest Greens certified installation based Franchisees? Southwest Greens was started in 1996 in Scottsdale, Arizona. Since inception, our company has been ingrained with a culture of dedication to high quality products and installation methods, which provide ultimate satisfaction among Southwest Greens’ clients. Our products and installation methods have been refined and improved to what we feel are “best in class.” We have made the strategic business decision to franchise our network of installers in exclusive protected territories. This allows us to maintain the dedication to high quality installations as we grow in size and scope worldwide and ultimately provide higher levels of client satisfaction among our entire system of franchisees. The only way to get the Southwest Greens product is through our system of franchisees. 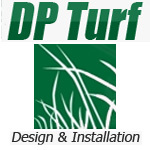 We have chosen not to sell turf directly to the consumer or directly to other businesses since we are not interested in attaching our name to below average installations should they occur. Moreover, our system of franchisees has secured strategic business relationships with contractors of various lines of business who understand the attentiveness to detail it takes to install a Southwest Greens product. They have chosen to refer their clients to our franchisees to give their clients what they feel is the best product on the market. We have been extremely fortunate in having the opportunity to call several PGA Tour Players, clients. We do not pay these individuals endorsement fees to say what they say. Furthermore, leading golf course architectural design company, Nicklaus Design®, has chosen Southwest Greens to exclusively offer a premium line of synthetic golf green designed by their firm (participation fee required for right to offer Nicklaus Design® line of greens). With our worldwide branding, commitment to high quality installations and relationships with our clients, our exclusive installation based franchisees protect our name and reputation in the synthetic industry. One of my proudest accomplishments in my life is to say, I have worked with my brother for what is coming up to 33 years in business together. We are a true owner/operator company. Derek and myself are on all construction projects, working alongside our crews. This has created a culture for the crew to always go above and beyond our customers expectations. All job sites are well thought out and prepared for a smooth construction experience. Besides exceptional quality work, we are very clean, neat and clean our job sites daily, so as to look as if we were never there. On projects that take more than a few days, a portable restroom is brought in for the duration of the project. To help with excessive lawn or site damage, we also use plywood planking to keep the damage to a minimum. We are always trying to be a great company. To surround your new backyard living space, an architectural landscape drawing is available. We can dress up the area with shrubs, perennials and annual flowers. Your next step is to add night lighting to your project. This will enhance the beauty of your backyard and increase your enjoyment in the evening. We love to do this work and hope to bring our enthusiasm to your project. 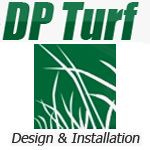 Welcome to the DP Turf Blog! Please check back often to stay up to date on all the is happening in and around the world of golf, turf and landscaping! The first full week of April is like Christmas to all golfers. 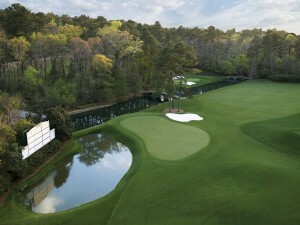 It is Masters Week! With Jordan Spieth, Jason Day and Rory McIlroy involved, it should be an exciting back nine on Sunday afternoon. 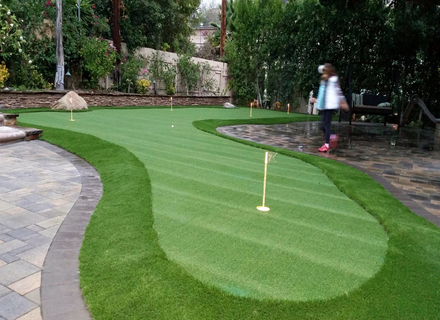 Now that your golf juices are flowing and you are dreaming of lowering your handicap, you should think about installing a Southwest Putting Green in your backyard! This synthetic green reacts like a real green. You can hit chips, pitches and full shots into this green and the ball will check up and stop on a dime. Once I am done creating your dream, the green will putt at a 10-12 on the stimpmeter. How great would it be to putt on a green that rolls like Augusta National?! To everybody that has that “great lawn envy”, water and fertilizer are two very important parts of a strong, healthy lawn. The forsythia plant is starting to bloom its bright, beautiful, yellow flower. That means it is time to apply your crabgrass preventer/fertilizer application. This is the first of 5 applications that we use for our fertilizer customers. The end of April is also a good time to start up your lawn sprinkler system and see what type of damage might have happened over the Winter. As the system ages, rotors can stop turning and sprays can get clogged. Water conservation and water bans have become an important consideration for all towns. This is one reason you should have your system checked. The other reason is for that strong, healthy lawn. Proper watering is vital for your lawn to grow and to stay green.